Deuces Wild, Joker Poker etc. Join our newsletter to be informed about new releases. Your email address will be kept absolutely confidential -- it will only be used to send you our free newsletter. You can quickly and easily unsubscribe at any time. BVS Video Poker 3.0 for Windows XP/2003/Vista/7/8.x/10 is an enjoyable game that simulates video poker gambling machines. It features the most commonly found machines in casinos: Deuces Wild, Jacks or Better, Joker Poker, Joker Wild, Bonus Poker, Ace and Deuce, Bonus Deuces, Seven Wild and more. 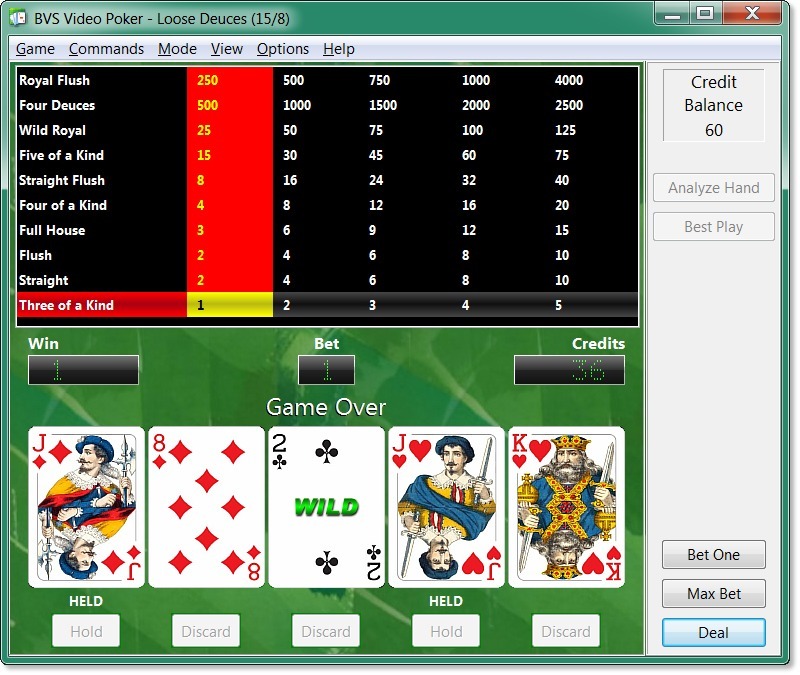 BVS Video Poker can also used as tutorial software. It trains you to use the best long-term strategy for the video poker machines you choose. Each variation of video poker has its own individual winning strategy, so taking the time to learn your game will result in better payoffs. BVS Video Poker provides you with statistical analysis for any hand you can play. In AutoHold mode program shows you the best cards to hold and automatically holds them for you. It can also alert you when you make a mistake in playing strategy. It keeps the list of all your mistakes and shows the percent advantage that you lost due to your errors. You can also analyze any hand to find the best choice. BVS Video Poker includes 42 variations of video poker. It features: statistics analysis for multiple players, selectable backgrounds, customizable pay table for each game variation, sound and more... Check out the full list of features. Register BVS Video Poker now with your credit card using secure order form. You will receive a registration code within a few minutes. 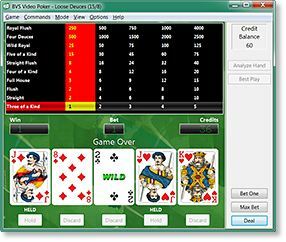 Plus - when you register, you will also get BVS Video Poker Plus Pack that adds additional card sets and greatly enhances the number of excellent backgrounds available in background selection dialog. Copyright © 1996-2019 BVS Development Corporation. All rights reserved.